It has become a daily occurrence to randomly hear a startling eruption of Delilah suddenly darting after Pequenita and chasing her down the hall in a race to our bedroom. Our first inclination is to holler at Delilah about the altercations, but there has been plenty of evidence implicating ‘Nita as the occasional instigator. We try to pass it off as sibling rivalry, but I suspect the infamous history of perceived animosity between their species is the real culprit. 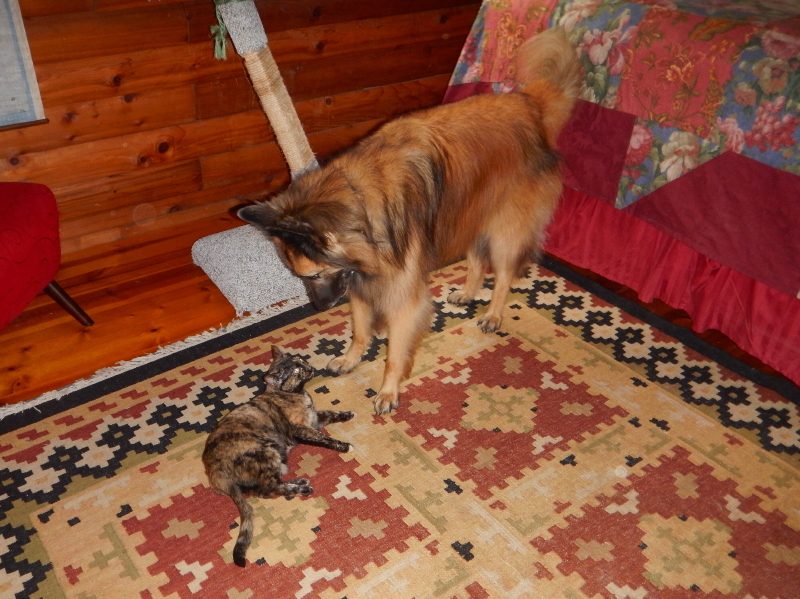 Delilah wants to play like a dog and Pequenita seems to think that is a ridiculously un-feline way to behave. There is no doubt that Delilah flaunts her size advantage. On more than one occasion, I have seen Delilah simply walk over and stand above Pequenita. Sometimes she will try to augment that with a single paw draped over ‘Nita’s back. Pequenita’s response depends on her mood. She always seems wary of the possibility things could escalate to a hazardous level, but primarily chooses to be patient and wait out the disturbance in her finest queen-of-the-world repose. When the canine gets distracted for a second –a guaranteed occurrence, every time– the feline will make her escape. That is the moment the unexpected race to the bedroom suddenly shatters the serenity we might otherwise be enjoying. Sometimes, when I reach down to pet Pequenita, her back feels wet. I always hope it was just a gentle grooming she received from Delilah’s tongue, and not an attempted “tasting.” We have seen Delilah hold her mouth open, combing Pequenita’s back and tail with her teeth as the cat walks away. Then we get that look from the dog. Our house pets are doing nothing to refute the perception that dogs and cats can share living quarters, but it’s mostly a function of barely tolerating each other in the face of a constant preference to rather be with their own kind. Sounds like a couple of political parties I’ve read about. Hmm. One method of helping dogs and cats get along well with each other is to socialize them when they are little puppies and kitties. I wonder if we can devise a way to eventually improve government function by intentionally striving to get play dates between children whose parents hold opposing political views. I’m not confident the planet will remain habitable long enough to see if that could work. Living in a house with a couple of pets who are constantly practicing the art of tolerating each other has me frequently thinking about how nice it is when we all just get along.